Rush is how we get to know each other. You'll be able to grab some dinner with us and get a feel for what we're all about. What makes Theta Chi a great choice? Alma Mater first and Theta Chi for Alma Mater. Since Theta Chi Fraternity was founded on April 10th, 1856 its members have sought to make lasting impacts on their respective campuses. In the Alpha Nu chapter, our brothers actively carry out this mission through high scholarship, leadership, professional development and philanthropy. Theta Chi is a place to grow and create a bond of brotherhood for life. Theta Chi is a place where scholarship takes precedence. 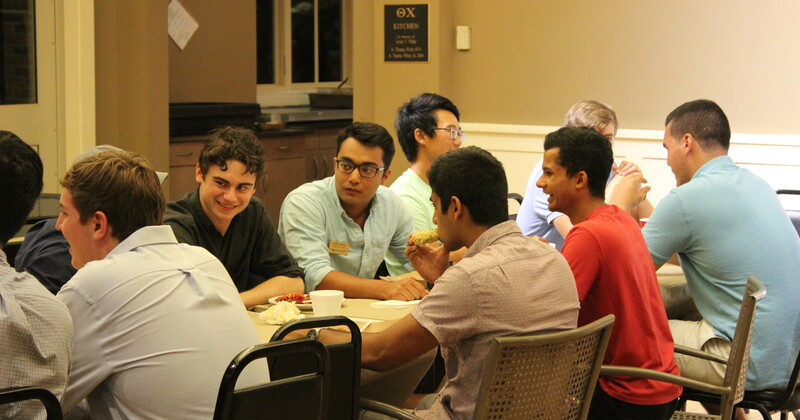 65% of brothers receive merit-based tuition scholarships as they pursue some of the most challenging coursework Georgia Tech has to offer. Additionally, our brothers take on challenging leadership roles in campus organizations such as FASET Orientation, the Ramblin’ Reck Club, Student Government Association, GT Student Foundation, and the Student Alumni Association just to name a few. The motto of Theta Chi is an Assisting Hand. Our brothers believe strongly in the importance of philanthropy both on campus and in the surrounding neighborhoods of Atlanta. Whether it is at the Atlanta Humane Society, Tech Beautification Day, or our very own Shirlock Foundation, all Theta Chis are expected to make an effort to help those in our community. We pride ourselves on seizing opportunities for excellence. Athletics give us an opportunity to do so through Intramurals and Greek Week. In the last nine out of 12 years, we have been champions of Greek Week. We also never miss out on an opportunity to cheer on our brothers who are involved in organizations such as Club Soccer, GT Rugby, GT Crew, and Club Tennis. Theta Chi hosts a large number of social events such as band parties, trips to away football games, summer lake trips, winter cabin weekends, as well as our spring Red Carnation formal. Every Theta Chi’s journey begins at rush. We invite you to learn more about who we are and what we do at rush. Questions? Feel free to shoot our rush chair an email. More information on our officers can be found on our officers listing. Theta Chi currently has 152 active chapters across the United States. Learn more about other chapters, the Resolute Man initiative, and more at their official website.